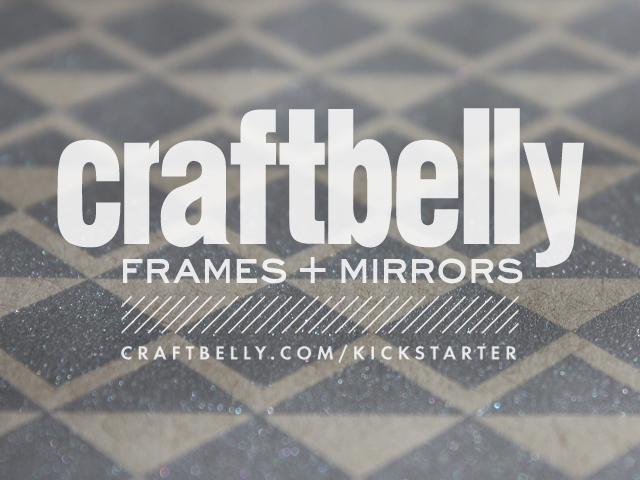 Craftbelly Kickstarter Campaign goes live tonight! The most exciting Craftbelly adventure I've ever been on is embarking tonight! I'm launching a Kickstarter campaign to raise enough money, $5000 to be exact, to print a brand new line of original screen printed decorative paper, designed by me. This is something I've dreamt about for the last couple years, and thanks to the encouragement and support of some awesome friends, it's finally happening. I chose to use Kickstarter as a platform because I absolutely love the idea of getting a whole community involved from the very beginning. It's a great way to find out if the support and interest for what I'm doing is out there and to get immediate feedback from current and future customers. Printing a large amount of paper in a variety of colors and patterns will help me launch this new chapter of my business in a big way. Not only will I be able to create a new line of frames using the new paper, but I will also introduce brand new products such as stationery sets, journals and the paper itself! I can't wait to document the entire process, which I will do right here on my website, through videos, photos and more. I look forward to sharing this journey with my friends, family, current and future fans, and the amazing independent crafting and design world here in Chicago. Without any of you, this would not be possible. So thank you! Click here to see the project!